Because of its watermarked logo, I’m not a huge fan of embedding YouTube videos on a website. However, from a social media perspective (including the fact that iPad/iPods can view the video), I understand why some folks (including our own Living in Las Vegas Podcast) do so. Besides the watermark, one of the other complaints about embedding a YouTube video is that when grabbing the embed code from the YouTube site, you can’t have the video start automatically–when the visitor hits the page. Now, to be sure, there are arguments for and against doing so. To really understand the value of autoplaying a video, you should do some A/B testing to see which technique helps best improve the results of your call-to-action. The good news is that you can autoplay a YouTube video. And it’s very easy to do. Simply add “autoplay=1” to the embed code. That’s it! Easy, peasy, 1-2-Threesy. That’s the good news. The bad news, as is demonstrated by the embedded YouTube video below, is that I cannot set the volume programmatically. For me, I consider this a show stopper. There is something to be said for autostarting a video, with the sound off, to create curiosity. But, if I’m blasting audio to a visitor who did not ask for it, that’s a problem. Besides autoplay, there are many other parameters available for embedding a YouTube video. For a list of all the parameters, go here. Getting Your Video Indexed by Google: Is YouTube The Only Answer? Part of my online toolkit includes LivePerson, software that allows me to chat with people who visit our website. LivePerson also provides a real-time view of who is on your website, and how they got there. 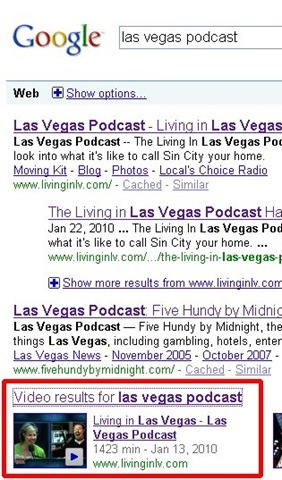 Many times during the day, I’ll catch somebody visiting the Living in Las Vegas Podcast website via a Google search for “Las Vegas Podcast”. From time to time, I’ll check out that person’s Google search to see how we’re ranking. . .and what other sites are being listed. As I was checking out our ranking on Google this morning, I saw something fascinating. . .and VERY promising. 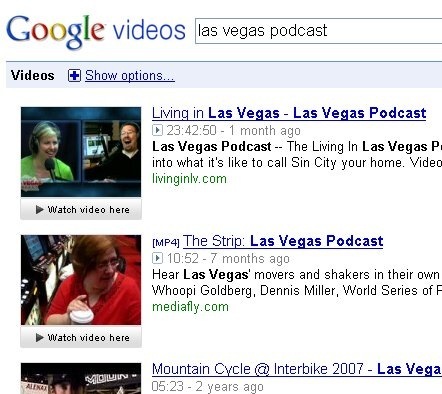 Along with searching the web for “las vegas podcast”, Google also initiated on its own a video search for “las vegas podcast” as well. As the screen shot shows, Google found our latest video podcast episode, which is self-hosted. I’ve experienced Google’s YouTube fixation. I have other search engine phrases that I’ve previously been ranked #1, only to slip down a spot or two because a YouTube video uses the same keywords. What I didn’t expect is that Google would be able to (or want to, for that matter) index a self-hosted .MP4 video. 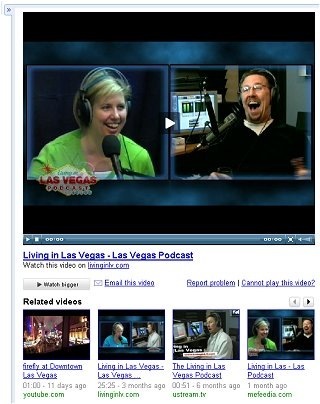 When I clicked on the “Video results for las vegas podcast” link, I was further impressed. My guess is that the reason we’re seeing this happen is because our self-hosted videos are MP4 videos. We’re also using the jwplayer Flash player, which seems to be helpful as well. Regardless, this is GREAT NEWS! The fact Google is indexing this content demonstrates that when done correctly, embedded video does provide more content for Google to index. What does that mean to you? Well, it doesn’t mean you should ignore YouTube. Google has much love for YouTube. But it DOES mean you should recognize that embedded video increases your probability of being discovered via Google.